This cake is delicious, chocolate with a bit of tangy lemon taste. It goes perfectly well with a cup of strong black tea. It's not too sweet as I've always reduced the sugar and added in some rum which makes it all the more delectable! I divided the batter into 2 equal portions, added one with chocolate powder and rum while the other is with lemon juice and rind. 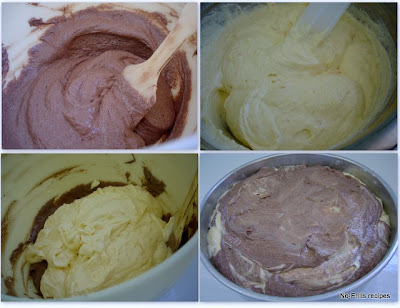 Pour the lemon batter onto the chocolate batter and then just pour the batter onto the prepared cake tin without mixing and let the pattern takes its course. Mmmm this cake is truly delicious, soft and moist ........................ Enjoy! Lightly grease and flour an 8 inch round/square tin. Beat the butter with the sugar till light, fluffy and creamy. Gradually add in eggs, one @ a time, beating well after each addition. Add the cocoa/chocolate powder and rum to one part, mix till well combined. Add in grated lemon rind and juice to the other part, mix well. 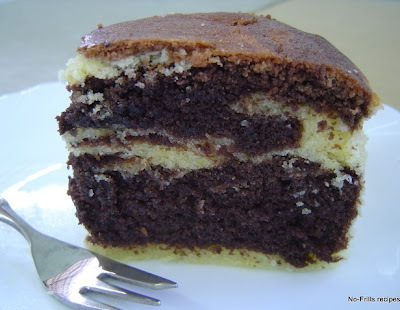 Pour the lemon mixture onto the cocoa mixture (no mixing), then pour the whole mixture onto the prepared cake tin. Bake in preheated oven @ 180 degC for about 25 to 30 mins. Insert a skewer into the centre and see if it comes out clean. Let the cake cool in the tin for about 5 mins. before transferring to a wire rack to cool completely. Note: You can subsitute lemon with orange juice and rind. I can see the cake is really soft and moist. I am bookmarking this to try it out later. Looks moist and yummy. Love to have a slice. Chocolate with lemon - hmmm...that is a good contrast of flavors. Looks very moist and delicious. Love the colour combination there. I can imagine the beautiful flavour. I love anything with lemon. Yes, coffee or tea, good combination. Yes, sweet smelling. Btw, how are you feeling now, hope you're getting better. I've also baked one with chocolate and orange, but I prefer this lemon combination. Yes, I agree with you, I like the colour too! Thanks for sharing, next time I also want to add some lemon into my chocolate butter cake. Yes, do try it, tastes good! A very pretty cake and sounds lovely with chocolate and lemon flavors! I like chocolate with orange, this sounds really interesting! Must taste really good! The combination of flavours is unsual but good. I did it with orange too, but I prefer this combination, a bit extraordinary. I cant wait to try this as well as the fruitcake recipe and invite my girlfriends over for tea (or coffee :D )! Will the taste or texture be very different if I left out the rum bit? So you are back in the States? If you don't have rum or brandy, no problem, you just add in milk. It can be fresh or UHT milk, but I used skim milk powder to make the milk. Taste will be slightly different if milk is used but it'll still be moist. Remember the butter must not be too soft, room temperature and still hard in the centre. Happy baking! Olive. Thanks for dropping by. Do try the recipe and let me know. I made this today (finally!) and I like it! Its perfect for an afternoon tea as the texture is light and the chocolate flavor is there but not overpowering with a hint of lemon. 1) After beating the eggs with the creamed butter +sugar, the batter is not smooth. Looks a lil like scrambled eggs. my butter was cold, and my eggs were straight from the fridge too. 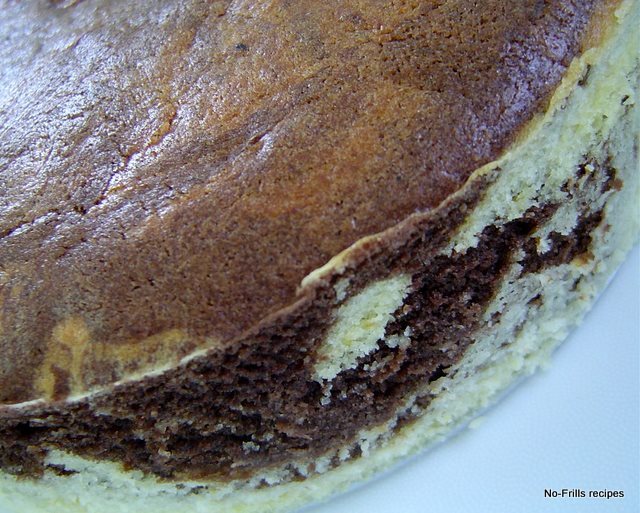 2) The top has cracks , not smooth but the cake did not collapse/sink. Appreciate your opinion on this as I would like to improve my baking skills. 1. First thing you should take note is that ALL baking ingredients must be at room temperature. 2. The 'scrambled egg' is curdling, because all the stuff were cold, esp the eggs. 3. If you've kept your butter, flour,eggs in the fridge, then you should take them out a few hours earlier or what I do is I take them out the night before, but not the butter. 4. Butter, must not be too soft, must still be firm in the center. If the butter is soft, spreadable, then it won't cream well, it'll be watery and your cake will be dry and coarse. Hope the above helps, happy baking!